Saskatchewan Waterfowl Hunting Outfitters, Whitetail Deer & Black Bear Hunts in Canada!!! Below are the names of some clients who have hunted with us. Any of them would be more than happy to tell you about their hunt and the service that we provided. All of them have hunted with several outfitters and can give you some insight into how we run our operation. Please feel free to e-mail or give them a call. Highland Outfitters unique locations offer you high quality hunting experiences. As one of our clients said, “Good Hunts with Great Guides, Cory is a straight shooter.” Nice Lodge, Good Food, No Surprises. 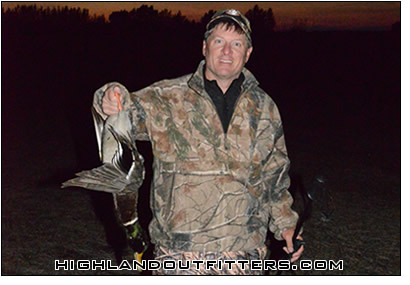 Having been in the outfitting business since 2001, you can expect a full effort from your hosts at Highland Outfitters. Our courteous experienced guides help make the trip what you have been dreaming of a reality. Highland Outfitters offers some of the finest waterfowl, whitetail deer and black bear hunting in the world!